Auckland As the sports commentators often say, LeBron James is “part of the conversation” on who might be the greatest basketball player ever. Having played with the Cleveland Cavaliers where he brought them a title finally after decades and the Miami Heat where he won two championships, he has been in the finals for umpteen consecutive seasons. Recently, at the end of a contract, he signed another with the storied Los Angeles Lakers to continue his career. LeBron knows basketball, so why is he at the center of yet more of President Donald Trump’s racist dog whistles to his base? Well, in defending fellow superstar and longtime opposition competitor Steph Curry’s comment earlier in the year that he and the Golden State Warriors had no interest in visiting the White House as long as Trump was running the circus there, LeBron had called the president a “bum.” Most of us would have thought that Trump would have been grateful. There were so many other things he might have said, as we all well know, but Trump thrives on conflict, so it was on. Trump bided his time but saw an opportunity. LeBron James continuing to be an ambassador for northeast Ohio and his hometown of Akron, opened a school there called “Promise Academy.” Trump pounced on him and insulted his intellect in a signal of racism to his hater band. He tried to get his goat by saying, “I like Mike,” meaning in the arguments between the two he favors Michael Jordan for the GOAT award. Jordan for his part voted for LJ, meaning LeBron James. Melania Trump, the first lady, earned some respect, saying for her part, she would love to visit Promise and see what they are doing for children in Akron. Most interestingly, I was captivated by the fact that LeBron gave every one of the children coming to the school a bicycle, explaining that having a bike when he was a boy opened up the greater world to him and allowed him to experience its potential and meet people, including white folks, and understand something outside of his home experience. What a wonderful story. Not the standard iPad or computer, but a door to the rest of the world and a way to exercise and be mobile at the same time. Trump had a golden opportunity, but he blew it. 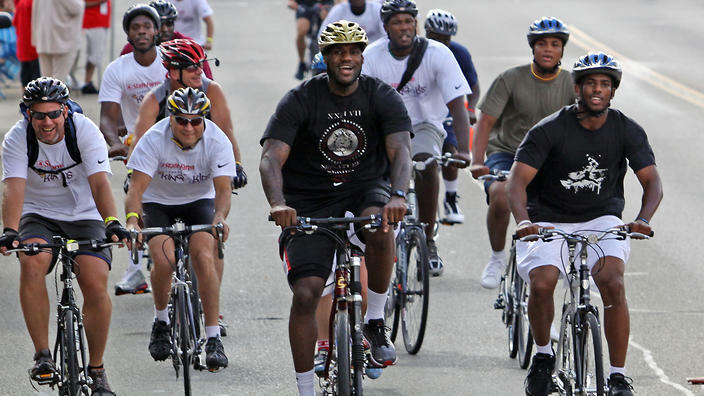 Some mass marketer or philanthropist will hopefully jump on the bandwagon soon to start a national program, let’s call it “LeBron’s bikes” to try and get bicycles to young people everywhere. And, if Trump doesn’t think LeBron is smart, how brilliant is it of LeBron to be identified with bicycles and not just basketballs. I bet there is a long line in front of his agent’s office of bike companies from around the world wondering what it would take to have LeBron pitch their bikes or how many of them they can give to children hoping for one. To miss this opportunity to make some huge social changes you must be some kind of loser bum. Gulfport Berea College is as close as something comes to a one-of-a-kind, single institution, social change education experiment. Founded 162 years ago by abolitionists in Kentucky to educate freed slaves and lower income white students, to this day the college only admits lower income students. The Times reports that 98% of its classes use federal Pell grants and 64% are first time college students. Amazingly, all four years of college are tuition free for the students. Why don’t we have more college like this! I’ve followed Berea at a distance with admiration. A former ACORN organizer in New Orleans moved to Berea when he fell for a local woman from there and always spoke of the town and the school with awe. Not being a college guy, I had looked them up back when and wondered why we didn’t recruit organizers there, and why they weren’t trying to get us to take summer interns, provide work study, and teach classes. All of which surprised me to see Berea in the papers in an article connected to the Republican’s tax bill. Turned out Kentucky’s Senator and Majority Leader Mitch McConnell tried to put in a last minute carveout for Berea that would exempt them from paying the additional tax the bill had put on college endowments valued at over $500,000 per student. The target was the Ivy League schools and other big hitters like Stanford and the like. Turns out little Berea’s big, billion dollar plus endowment puts them at $700,000 per pupil. Anyway, Democrats like Bernie Sanders put a red flag on the item as not being budget related and breaking the rules. Now, Berea is in the middle of a partisan squabble as McConnell tries to put the horns on Sanders, and Sanders retorts that McConnell and the Repubs ought to support his bill making all college tuition free. Somehow you know Berea is going to get a fix, but in the PT Barnum sense that “any publicity is good publicity,” let’s make the most of their moment in the sun, or storm, or whatever you want to call it. 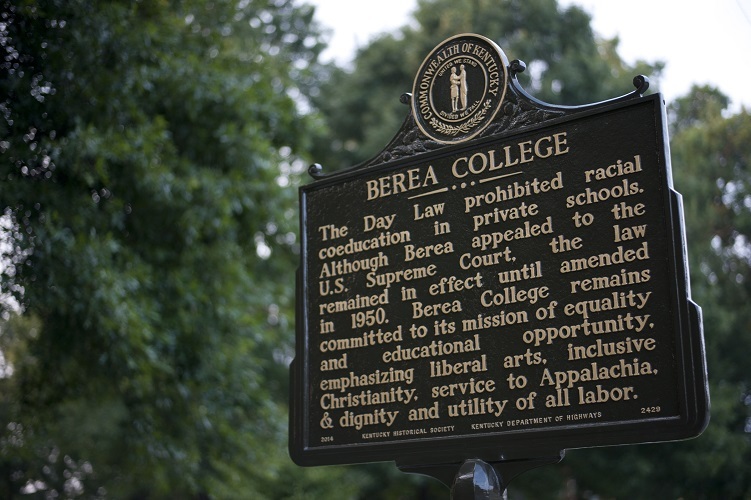 One thing that’s getting some more light as the sparks fly is that Berea is one of seven so-called “work colleges,” which is also interesting. The concept there is that students pledge to study and work throughout their time, arguably making them good-to-go for job skills and discipline when they matriculate, but also helping pay the bills in an equitable fashion without much, if any, student loan debt. Looking at the list of other schools, it’s a hill country kind of phenomena it seems with schools in North Carolina, Kentucky, southern Illinois and southern Missouri and Arkansas, including the College of the Ozarks. Better to look at these brave few schools than the ones the Republicans really seem to love which are the for-profit college. Secretary of Education and for-profit college investor, Betty DeVos says that she is about to release her plan to renege on canceling the loan debt for students who were ripped off by the for-profit scamsters who made claims that they couldn’t deliver. Obama’s people were going to cancel out 100% of the debt, sticking it to the fraudulent institutions. DeVos wants a formula that exempts students who are making 50% less than others, but makes those making 50% or more of other graduates in their cohort to have to pay some share of the loans. Let me get this straight. Republicans are claiming they love Berea which is about work, and Republicans also want to penalize students coming from ripoff schools who have taken the lemons, made lemonade, and are working. Does this add up? You figure?! ?